Budget balancer: Can you erase the deficit?  Raises the sales tax by one-quarter cent.  Raises vehicle registration fees by $12 a vehicle.  Adopts "Amazon" tax requiring online retailers to collect sales taxes.  Resurrects abandoned plan to sell and lease back 11 state properties, including the East End complex in Sacramento.  Adopts firefighting fee for rural homeowners.  Cuts the University of California and California State University systems by another $150 million each.  Defers $3.4 billion in payments to schools, community colleges and the University of California, forcing them to borrow to maintain programs.  Takes $1 billion from First 5 commissions, a move already under legal challenge.  Takes $1.7 billion from redevelopment agencies.  Borrows $740 million more from state special funds.  Cuts $150 million more from state courts.  Shrinks reserve to $570 million, compared with governor's proposed $1.2 billion. Today: Senate and Assembly meet to vote on "Plan B" budget bills, facing a midnight constitutional deadline to have pay docked. Today-June 27 (approximately): Gov. Jerry Brown has 12 days to sign or veto the budget bills after receiving them; he is expected to continue negotiating for his plan. June 30: The 2009 increases to sales and vehicle taxes expire. July 1: New fiscal year begins. With no bipartisan deal in sight, legislative Democrats are poised to approve a majority-vote budget today that cuts deeper into universities, raises car registration fees and extends a quarter-cent sales tax. According to an Assembly budget aide authorized to brief the press, the spending plan closes a remaining $9.6 billion deficit through accounting maneuvers, cuts, additional fees, delayed payments and a revamped plan to sell state properties. Several solutions could face legal challenges that threaten their viability. Gov. 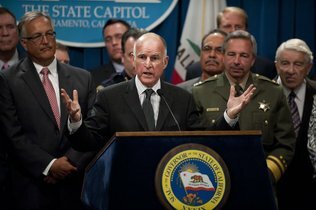 Jerry Brown suggested Monday he would consider signing a Democratic budget that relies on such solutions despite his previous opposition to proposals he considered "budget gimmicks." Midnight tonight marks the state's rarely met constitutional deadline for the Legislature to send the governor a budget. This year's deadline comes with real consequences for lawmakers: They must forfeit their pay starting Thursday if they have not yet sent the governor a budget. Voters passed the new rule last year as part of a measure allowing a majority of lawmakers, rather than two-thirds, to approve the budget. Legislative Democrats say they decided to pursue this plan because Republicans have refused to extend 2009 increases in sales, income and vehicle taxes. The majority party does not want to cut much further after imposing deep reductions in universities, health care and welfare earlier this year, while also facing a court order to move 30,000 inmates out of state prisons. The governor originally wanted an election on June 7 and negotiated with Republicans to have a tax measure before voters on that date. But Republicans balked in March, saying Democrats would not go far enough on their desired long-term changes. "(Republicans') inability to engage meaningfully in this process means the majority party has to go and continue to be responsible actors in the absence of anybody else," said Assembly Speaker John A. Pérez, D-Los Angeles. Republicans counter that Democrats have been stubborn in their demand for a maneuver that would maintain state taxes at higher levels until voters decide on taxes at the ballot. They also said Democrats moved too slowly on long-term reductions in pensions, a constitutional spending limit and regulatory rollbacks designed to promote business activity. "This is obviously a sham budget, and then they'll work on what they consider to be the real budget in the meantime," said Sen. Bob Huff, R-Diamond Bar, Senate budget committee vice chairman. Brown would have 12 days to sign or veto the Democratic budget once lawmakers send it to him. Both Steinberg and Pérez have suggested that Brown will use that window to continue pushing for a compromise with Republicans. Some of the most controversial components of the Democratic plan include additional fees  and one tax. One bill would raise $900 million by partially unwinding a labyrinthine 2004 tax swap involving local governments. Though the state sales tax is slated to decline by one cent in July, the Democratic proposal would lead to a three-quarters-cent reduction  or a quarter-cent more than shoppers would otherwise have to pay. Democrats believe they can pass this on a majority vote, though anti-tax groups have questioned that notion in the past. The plan also includes a $12 increase in the state's vehicle registration fee  a different charge than the higher vehicle tax Brown is seeking. The higher fee would fund the Department of Motor Vehicles and shift $300 million to the general fund. The Democratic budget relies on raising $200 million by forcing online retailers like Amazon to start collecting state sales taxes. It also includes a new charge to rural homeowners who rely on the California Department of Forestry and Fire Prevention, raising $150 million. Fresh off Controller John Chiang's report Tuesday that the state received $408 million more than expected in May, Democrats are embracing a more optimistic projection of revenue that sees them increasing by $800 million. That comes on top of the Department of Finance's assumption that the state will receive $6.6 billion more in revenue due to improved economic indicators. Democrats also are resurrecting a $1.2 billion sale of 11 prominent state office properties, including the East End complex and attorney general's headquarters in Sacramento. Brown dismissed that idea in February after critics sued to block the deal and the proposal came under fire from budget analysts. The nonpartisan Legislative Analyst's Office said it was equivalent to borrowing at more than 10 percent interest over 35 years. The deal would still involve California First LP, the consortium of investors engaged in the original sale. But the Assembly budget aide said that it would be restructured to ensure the state could regain ownership of the buildings after the leases expire. Democrats are also proposing an extension of a 0.15 percent state vehicle tax that provides $500 million for local law enforcement programs. That tax had been scheduled to expire. The plan would require a two-thirds vote; if Republicans reject the plan, Democrats say the funding would be cut. The majority-vote budget does not aggressively attack the so-called $35 billion "wall of debt" that Brown highlighted in his May budget revision. Instead, the plan maintains borrowing like deferred payments to schools and loans from state special funds. Call Kevin Yamamura, Bee Capitol Bureau, (916) 326-5548. Reader comments on Sacbee.com are the opinions of the writer, not The Sacramento Bee. If you see an objectionable comment, click the flag icon below it. We will delete comments containing inappropriate links, obscenities, hate speech, and personal attacks. Flagrant or repeat violators will be banned. See more about comments here.  Keep your comments civil. Don't insult one another or the subjects of our articles. If you think a comment violates our guidelines click the flag icon to notify the moderators. Responding to the comment will only encourage bad behavior.  Don't use profanities, vulgarities or hate speech. This is a general interest news site. Sometimes, there are children present. Don't say anything in a way you wouldn't want your own child to hear.  Do not attack other users; focus your comments on issues, not individuals.  Stay on topic. Only post comments relevant to the article at hand. If you want to discuss an issue with a specific user, click on his profile name and send him a direct message.  Do not copy and paste outside material into the comment box.  Don't repeat the same comment over and over. We heard you the first time.  Do not use the commenting system for advertising. That's spam and it isn't allowed.  Don't use all capital letters. That's akin to yelling and not appreciated by the audience.  Don't flag other users' comments just because you don't agree with their point of view. Please only flag comments that violate these guidelines. You should also know that The Sacramento Bee does not screen comments before they are posted. You are more likely to see inappropriate comments before our staff does, so we ask that you click the flag icon to submit those comments for moderator review. You also may notify us via email at feedback@sacbee.com. Note the headline on which the comment is made and tell us the profile name of the user who made the comment. Remember, comment moderation is subjective. You may find some material objectionable that we won't and vice versa.